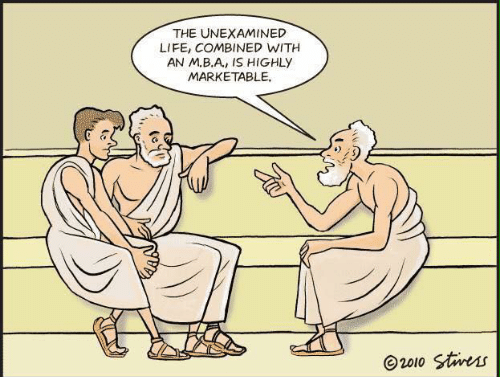 Socrates at his trial for impiety and corrupting youth in Ancient Athens, for which he was subsequently sentenced to death, is said to have uttered the dictum that “The unexamined life is not worth living.” This final lesson has been long thought of as the foundation for the art of philosophy. He was found guilty of inciting the youth of the city to question the traditions and ideas they inherited from their elders. He was deemed dangerous for his teachings and actions challenged the cultural status quo. To a large extent, this is the same crime for which Jesus too was condemned and executed by his culture. What does a good life look like? What does a life of meaning resemble and include? Is it more about what you do or who you are? Is a good life principally concerned with the past;? the present;? or the future? Our continuing and expanding cultural wars of today are increasingly fought around notions of identity and belonging. What does it mean then to be Christian? To live a life rooted in the ethos and commitment to walk as Christ walked, to follow Jesus as guide, teacher-coach and savior? First John is written as a sermon and lacks the opening, greeting, thanksgiving and closing greeting that mark most New Testament Epistles (or pastoral letters). The author’s key purpose is to defend Christian communities against false prophets and to remind them that as children of God they are to live in the light and love one another. The “enemies of Christ” against whom the author warns have apparently left the Church, and have persuaded many members to join them. We don’t hear from them directly, nor do we know exactly what they taught and did (as we only hear one side in this letter, as in all letters) but we can deduce that the division they created is related to the incarnation of Christ, recognizing Jesus as fully human and fully divine, and the consequences of such hope in terms of our own humanity: the way in which live apart and together. In order to warn members of the church community, Christians, against the teachings of these false prophets, the author explains that it means to be a child of God. This pastoral letter lifts up a clarifying notion of what the life of a Jesus follower resembles: one of Christ-like-love of God, of others and self. How does God in Christ give you life? ; joy? How does living in the fellowship of that life bring you life? ; joy? How does the admonition to abide in Christ and abide in the fellowship of the Church shape your life? ; the way you make meaning in life? ; your definition of a meaningful life? Is this word about life and fellowship a disturbing word for our culture today? How so? ; Why not? How do you hear the Spirit of God inviting you to act, speak, be, or live relationally today through the word of this scripture?